Hi loves! Since I'm on vacation right now, I asked some of my favorite bloggers if they wanted to do a guest post while I'm gone. One of the talented ladies that said yes is Ida from Ida Nails It. This girl is one of the reasons I'm developing a certain addiction.. a Pahlish addiction to be exact! She also takes these gorgeous daylight pictures, so make sure to pay her blog a visit. Let's check out what she created for this guest post! Hello! This is Ida from Ida Nails It. I absolutely love Deborah's swatches and nail art. She is always a blogger I refer to when I am looking for collection photos. So I was more than happy to be able to guest post for her while she is away. 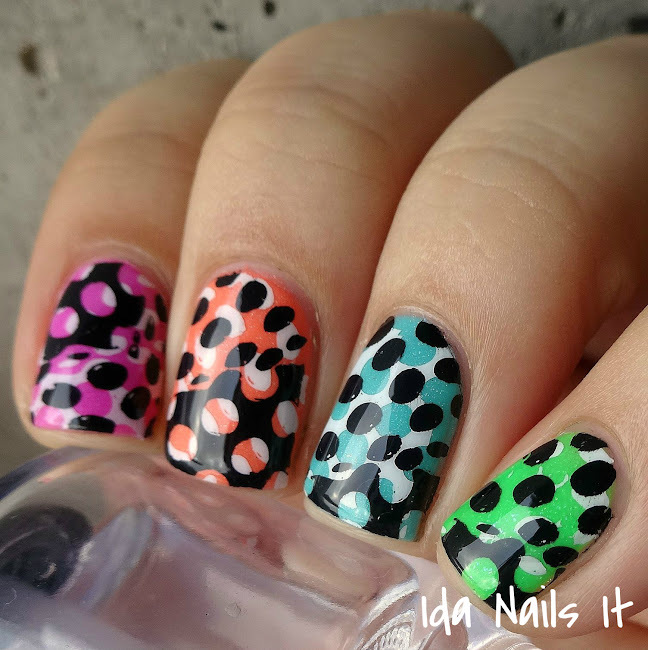 What I decided to do for my post is a skittle double stamped nail art look. I have a major weakness for bright polishes and with all these wonderful summer collections that have released within the last few months, I did not lack for bright colors! I had recently received my order from Gunpowder Lacquer, a brand new indie brand to debut in July, and knew that I had to wear them all together in a skittle look. All the colors shown are from her debut Sunshine & Whiskey Collection. From left to right, I used: Little Red Wagon, Drivin' Me Paisley, Sundaze, Floatin' Trailer Park, and Meet Me in Margaritaville. I wanted to add just a little more color contrast to tie all the colors together, so I decided to do some double stamping. I used a bubble pattern from Moyou London Time Traveler: Back the 70's Plate 03 and first stamped with a white stamping polish and then stamped with a black stamping polish. I didn't want to have the all the nails look the same, so I placed the pattern differently on each nail. One more layer of my favorite glossy topcoat and that's it! Simple but striking nail art. I hope you all like the look that I did and a big thank you to Deborah for having me guest post! Well... as you all know I loveee double stamping.. and this skittle look is so amazing with this technique! It ties the colors together so nicely and the black & white look pops really well against all shades. Thanks Ida for this gorgeous look!